Praseodymium was discovered in 1805 by Baron Auer von Welsbach in Vienna, Austria. 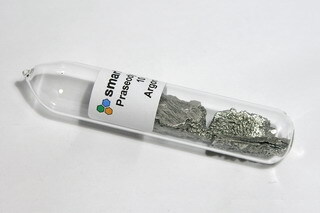 Praseodymium is a soft, white metal and a member of the lanthanide group of elements. It closely resembles neodymium and, along with other elements of the same group, is found in the same minerals. It has an abundance in the earth's crust of 9.5 ppm. It reacts slowly with oxygen but rapidly with water. As a pure metal, its uses are limited; however, it is used as an alloying constituent for alloys used to make permanent magnets and flints. Along with neodymium, praseodymium is used to manufacture yellow glass which can be used as eye protection (e.g. for welders). in Ampoule under Argon. Due to its air sensitivity it is hard to find in this form.